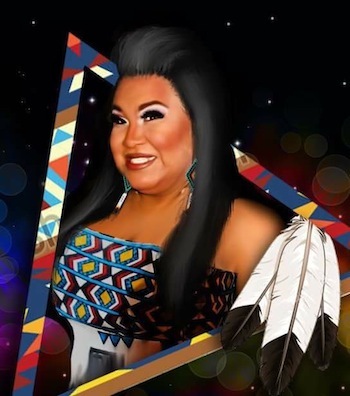 After years of talking, Argintina Hailey has joined forces with others in her First Nation’s community to host Morley Pride this weekend. “You can say, in some terms, it’s our ‘coming-out,” said Hailey. It’s not a coming-out for Hailey. She’s been performing as a drag queen for 16 years – not quite half her life. She created Argintina Hailey in Calgary, where she performs mostly, but has taken her drag queen persona to shows in Edmonton, Vancouver, Houston, Spokane, and Las Vegas. It’s a coming-out for First Nations in Alberta, says Hailey. This is the first time an event that highlights drag queens will be held on a reserve in the province. It’s almost a natural follow-up for the Two-Spirit Nations of the Treaty 7, a group Hailey belongs to, which participated in last year’s Gay Pride parade in Calgary. Hailey says Morley Pride is an invitation to the community to come out and be entertained by two-spirited people. She says family and friends tell her they want to take in her shows but are uncomfortable about attending the gay bars in Calgary in which she performs. But Morley Pride is about far more than the entertainment value. Growing up on Wesley First Nation, Argintina (which is a stage name) says life wasn’t as difficult for her as she knows it was for other two-spirited First Nations people. “It was more a self-doubt about how we were going to be perceived,” she said. While others paved the way before her, Hailey says younger two-spirited people call her “Mama Argintina” and tell her she gave them the strength to be open about who they are. “There are people who are now openly living together on reserve and they’ve been accepted as such,” said Hailey. It was this desire to be open that first had Hailey talking to others on the Stoney Nakoda Nation about doing a show like Morley Pride. But it wasn’t until she heard that The Beardy's and Okemasis First Nation in Saskatchewan had hosted a Two-Spirit Festival that she decided the time was right. Hailey has lined up the entertainment for Saturday’s show, which will be held at the Stoney Nakoda Resort and Casino. Hailey will be joined on stage for the feature drag show by Miss Ellen Q and the Pumas, out of Banff, and Visa De’Klein from Calgary. Nina Tron is the special guest. Girls Got Rhythme Band, a contemporary music band, will be opening the performance. Two-spirit comedian Dane Cunningham will MC the drag show. Native dancers will also be showcasing the different styles of pow wow dancing. Bringing drag queens together in the same show with traditional dancers only underscores that everyone is from the same community, says Hailey. Hailey is hoping Morley Pride will become an annual event, to take place the last weekend in August. “We are going to see how this event turns out. If it’s big and huge and we have the support we’ve had so far then we’ll do this as an annual event,” she said.